She's about to finish her wildly successful year-long Mrs. Carter World Tour. But Beyonce is fitting in some downtime in the romantic City of Lights with Jay Z. The 32-year-old shared photos on her Tumblr page playing the tourist as she visited the Eiffel Tower and the Louvre in Paris with her music mogul husband. Proving she's just like thousands of other visitors, Beyonce took one of those fun pics giving the illusion of the Eiffel Tower fitting in between her finger and thumb. The former Destiny's Child frontwoman tried to go unnoticed by covering up her highlighted locks with a black hoodie and hiding behind a pair of dark sunglasses. She wore a slick of bright red lipstick as she stretched out her arm and pretended to palm the lit up iconic structure. In another snapshot, the Drunk In Love singer is huddled close to Jay-Z with the Louvre's infamous glass pyramid in the background. The happily married couple are clad in matching head to toe black outfits as they posed outside the world renowned museum. 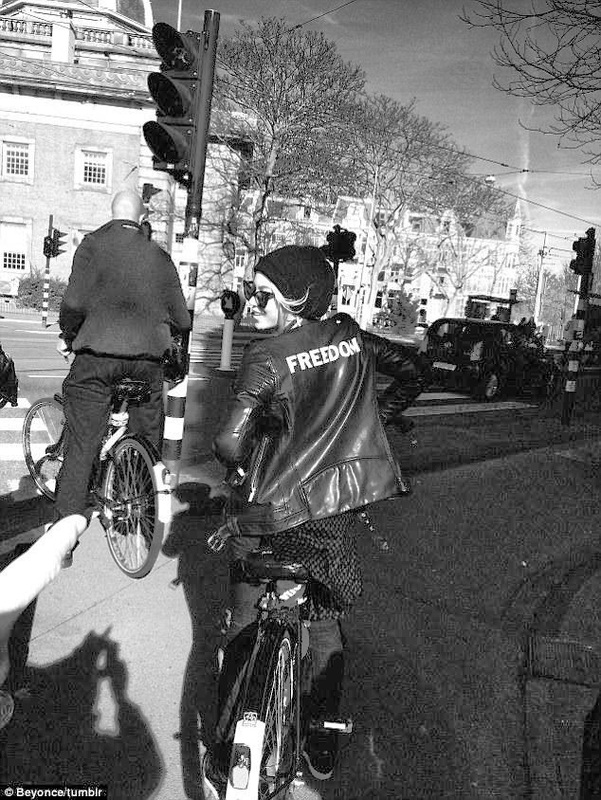 Wearing a black leather jacket with the word 'freedom' printed on the back, Beyonce also enjoyed a bike ride through the romantic capital.